This entry was posted on Saturday, 4 May 2013 18:05 at 18:05	and is filed under Iraq local elections 2013. You can follow any responses to this entry through the RSS 2.0 feed. Both comments and pings are currently closed. Some dyala residents are arguing that the results in their province are evidence of massive fraud. Does anyone have any thoughts? I have no specific empirical basis for suggesting fraud, however the numbers themselves are quite remarkable. Whereas the total Sunni/secular vote in Diyala has remained at around 200,000 in 2005, 2009 and 2013, and the Kurds have scored between 40,000 and 60,000 votes each year, the Shiite vote has grown from only some 50,000 in 2009 to a whopping 170,000 this year! It could of course be a case of extreme mobilisation inside the Shiite community to bring people to the ballot boxes. However, the combined Shiite Islamist parties received no more than 84,000 in 2005, which was also a year of Shiite mobilisation. There was also some reported incidents of ballot boxes being burned in Dyala. After the initial reports, I didn’t hear anything else on this. Is there more information out there? Did such a thing occur? 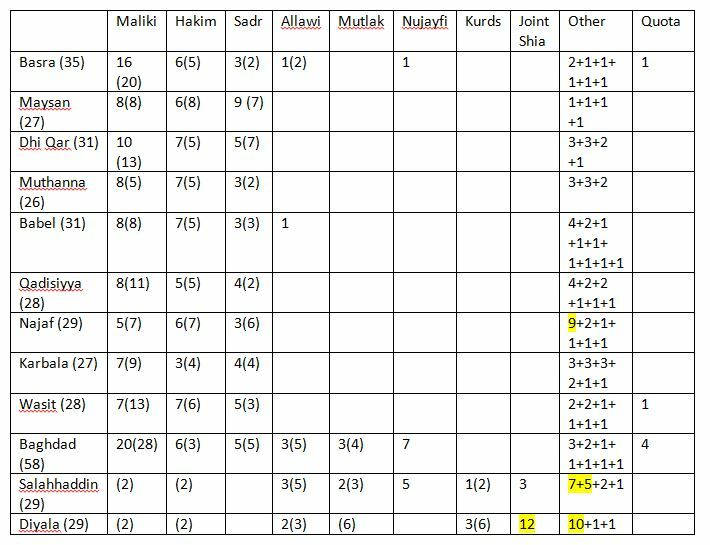 RV, any idea about how many seats Maliki actually lost compared to last provincial elections if you take away the Badr and Fadhila seats (given that they didn’t run with him in 2009)? Maliki lost 80 seats, comparing with the 2009 elections, and the important thing, today, is the rise of small blocks to the political scene, this is without doubt a kind of progress! Not sure where you get that figure from Ali, if we include Shahristani in the Maliki camp which I think we should do for purposes of comparisons since they ran together in 2009 as well, then we are looking at 50-60 seats. At least some of the decline is due to the change of seat distribution formula from largest remainder to Sainte Lague since the former favoured bigger parties. This election or the last ones not can make difference on the ground. basically most of the candidates are promoting themselves driven by the benefit package attached to their new job. «لا تناقش الأحمق أبداً لأن الناس لن يعرفوا مَن الأحمق منكما»، نصيحة الكاتب الأميركي الساخر مارك توين لا تنفع للأسف، عندما يدور النقاش حول العراق. فأكثر الحجج «ذكاءً» التي يتم تبادلها تعتبر «وضع العراق بعد الاحتلال أفضل من وضعه تحت نظام صدام حسين». قال ذلك ديفيد بولوك، الباحث في مركز دراسات الشرق الأدنى في واشنطن في مناظرة تلفزيونية عقدتها فضائية «سكاي نيوز». والسؤال الذكي الأساسي في تقدير بولوك هو مقارنة وضع العراق الحالي مع «نظام صدام حسين، والحروب المستمرة والضحايا بالملايين، من العراقيين ومن دول الجيران»! ويطرح بولوك بعدها الحجة الذكية الرئيسية الثانية، وهي «رغم كل المشاكل والأخطاء، لكن الآن يوجد أمل في المستقبل»! والرهان على المستقبل الذي يبشر به بولوك كرهان «الدليمية»، وهم سكان منطقة الدليم التي تضم الفلوجة والرمادي، وغيرها من المدن السبّاقة في إنقاذ العراق من عار الغزو، والسبّاقة في الثورة ضد لعنة الطائفية. وتقول النكتة إن «دليميه اثنين يلعبون على خط مرور السيارات السريع، ويخسرُ الرهانَ من تصدمه سيارة مرتين»!